Tervetuloa Eurooppaan! EIT Digital Summer School Invites You! Infotilaisuus 2.4.2019 klo 16:30-17:30 | Urban Mill – Building IntenCity! Tapahtuman järjestävät EIT Digital Summer School, Urban Mill ja Creative Life in a City -hanke (CLiC!) kumppaneineen yhteistyössä Aalto-yliopiston alumnisuhteiden kanssa. JOIN THE EIT DIGITAL SUMMER SCHOOL! EARLY BIRD OFFER: 2 weeks FOR 250€! FITech ICT and EIT Digital Summer School are welcoming industry professionals with residence in Finland to get hands-on experience in digital business development. The FITech ICT early bird offer is 250€ including accommodation for 2 weeks at one of the European cities! The two-week summer program combines state-of-the-art excellence in key digital technology with expertise in innovation and entrepreneurship (I&E). The summer schools are scattered across Europe in Lisbon, Eindhoven, Stockholm, Budapest, Rennes, Tallinn, Trento, Ljubljana, Munich, Bologna and Helsinki. They are perfect for those who want to deep-dive in emerging technologies and learn how to benefit from it in business situations. EIT Digital Summer Schools are part of EIT Digital, a leading European digital innovation and entrepreneurial education organization driving Europe’s digital transformation. EIT Digital is the Knowledge and Innovation Community of the European Institute of Innovation and Technology. FITech ICT Tech is a talent’s fast track to the future. The FITech network universities provide selected studies at all Finnish universities of technology. DIGITAL TECHNOLOGY INNOVATION AND BUSINESS DEVELOPMENT SUMMER 2019! If you are a professional with residence in Finland, you are not a student and you have a BSc or higher degree and/or long work experience in technology, you may register for the FITech ICT programs. 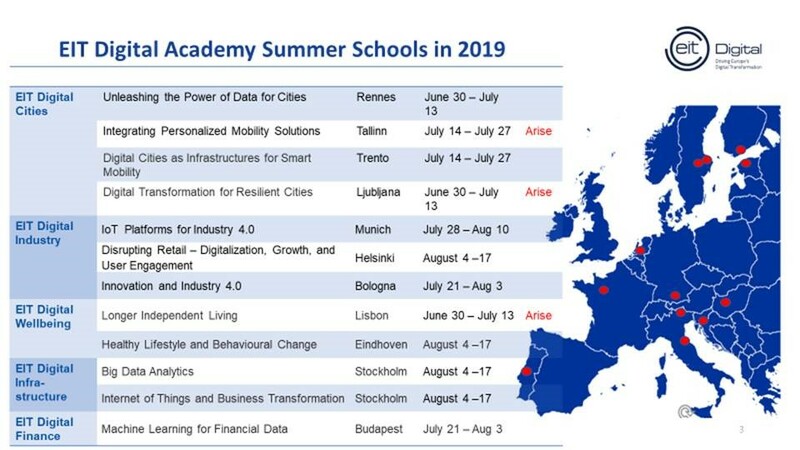 You can join the EIT Digital Summer School in any of the 11 designated European cities. The summer school cost is covered by FITech ICT. You need to cover the accommodation and travel. Accommodation for 2 weeks in a shared room costs 250€ if you register before April 15th, 2019. All seats and accommodation are subject to availability. Register now! This entry was posted in Aalto University, City of Espoo, CLiC!, EIT, From Espoo Innovation Garden, Kumppanit, Kurssit, Otaniemi, TEK, Urban Mill and tagged business development, digital technology, EIT Digital, FITech ICT, Summer Schools by larsmi. Bookmark the permalink.